The garage is new, from ferrous metal of 2,00 mm of a wall and 1,2 mm a roof, only 26000 UAH! 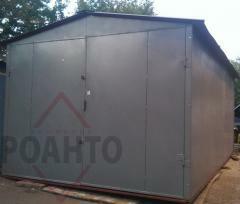 Garage 4х6, 1,2mm Price of UAH 25700 Kategoriya:garazhi 2,0mm, Garages from ferrous listoy metal, Metalwork. Company producer of a metal tile, professional flooring, roofing accessories. Garage metal 3Х5 1,2mm Price of UAH 21400 Garage metal 3Х5 1,2mm Category: Garages 1,2mm, Metalwork. Company producer of a metal tile, professional flooring, roofing accessories. Garage-3Х5, 1,5mm. 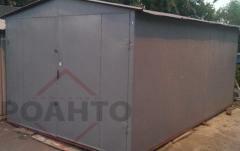 Price of UAH 24200 Kategoriya:garazhi 1.5mm, Garages from ferrous listoy metal, Metalwork. Company producer of a metal tile, professional flooring, roofing accessories. Garage from ferrous sheet metal 3Х5 1,2mm Price of UAH 21400 Company producer of a metal tile, professional flooring, roofing accessories. 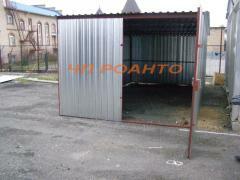 The garage is new, from ferrous metal to a wall 1,5mm and a roof of 1,2 mm, only 22900 UAH! 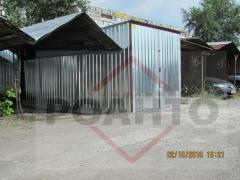 Garages metal folding 9200,00 UAH!!!! ACTION!!! 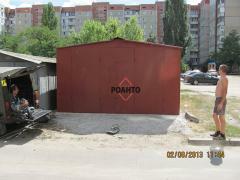 Garages are metal folding, Kiev!!! 9200,00 UAH!!! ACTION!!! The garage is new, from ferrous metal, all-welded!!!!! 13500,00 UAH. In thickness of 1,5 mm!!!! The garage is new, from ferrous metal, all-welded!!!!! 21400,00 UAH. In thickness of 1,2 mm!!!! 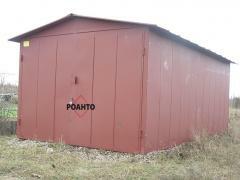 The garage is new, from ferrous metal of 2,00 mm, only 29300 UAH! 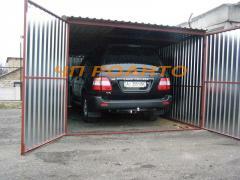 Unbelievable price on Garages in Kiev (Ukraine) company Roanto, PP. Wide choice of quality products at affordable prices.